What to do in Dallas? Visit Reunion Tower with your family, friends, or sweetheart and create unforgettable memories at 470 feet in the air. From 470 feet up you’ll experience breathtaking 360-degree panoramic views, high-definition zoom cameras, interactive touch screens, telescopes, a free digital photo and an indoor/outdoor observation deck that lets you see for miles in any direction. There are tons of activities for families to do at Reunion Tower. 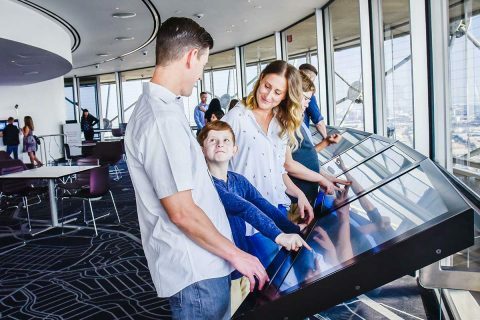 Plan a visit with your family to view Dallas from the GeO-Deck , explore the iconic Reunion Tower and the Dallas skyline in an entertaining and thrilling way with our 360 Degree Video Experience, enjoy an amazing meal at Cloud Nine Cafe, and much much more. Don’t forget to check out our Events calendar for special family events! Ready for a special date night? Take advantage of our Love is In the Air package for a memorable evening with your loved one, or write your love in the stars with our brand new digital, interactive experience Constellation. Don’t forget to check out our Events calendar for special events! 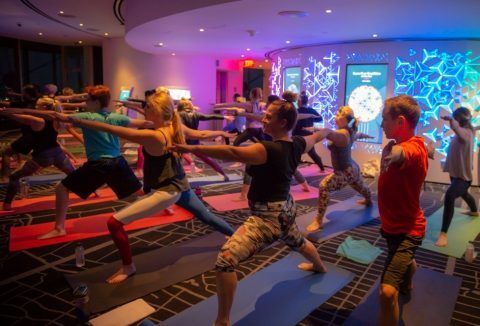 At Reunion Tower we like to host fun and special events that we hold during specific times of the year, like our Skyline Paint Party or our Sunset Sky High Yoga. Bookmark our Hours and Events calendar to stay up to date!